Welcome to laptop-battery.com.sg. High quality Laptop Batteries, Notebook Batteries are 30 Days Money Back, 1 Year Warranty! We warrant our products for 1 year under normal, non-commercial use. Defective products could be replaced if returned within a year since the date of purchase. The return must be accompanied by a Return Merchandise Authorization (RMA) number, which is to be issued upon request, and must be shipped prepaid. The warranty period is a year from the date of original purchase. A replacement item, if sent, does not restart, or in any way extend the warranty period. For battery pack or battery related products, cell capacity depletion over time under regular use is normal, and is not an indication of defect. Our warranty does not extended to any products that are physically damaged or that are not under normal operating conditions as a result of misuse or improper installation on the buyer/user’s part. If you change your mind and want to return the item for a refund, you can contact our customer services department and obtain a Return Merchandise Authorization (RMA) number within fifteen (15) days of purchase. Return within thirty (30) days from purchase can be for exchange, credit or refund at our discretion. NO REFUND accepted after 30 days of receipt. A product returned for refund or exchange must be in its original packaging, and it must be complete, and undamaged. Customer is responsible for shipping charges on returned items. For your protection, we strongly recommend that you insure your return shipment against loss or damages, and that you use a shipper that can provide you with proof of delivery. Returns within 30 days from receipt of order can be returned for exchange, refund or credit at laptop-battery.com.sg's discretion. Please be aware that specific manufacturers have more restrictive return policies. All products returned must be 100% complete, contain all original boxes and packing materials, have original UPC codes on the products, contain all manuals, blank warranty cards and other accessories and documentation provided by the manufacturer. If any of the above is not returned with the item, you may be subject to a repackaging fee, which will be determined on a case by case basis. 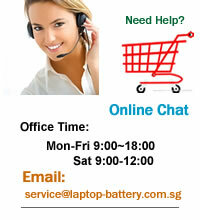 laptop-battery.com.sg accepts returns on merchandise from select manufacturers within 30 days from receipt of order. Original shipping charges are not refunded on returned items unless there was an error on our part. Please note: if you were eligible for free shipping on your order, and are returning for a refund, then the actual cost for shipping may be deducted from your refund. Customer is responsible for shipping charges on returned items. All shipping cost for returned merchandise will be paid for by the shipper. No C.O.D. on shipments will be accepted. Only shipping cost for incorrect items delivered to the customer will be paid for. We will not refund the extra shipping cost of express delivery. We will only refund shipping cost if the item is returned by First Class Mail, US Priority Mail or UPS Ground Shipping. If items are returned by express delivery, refund will only cover up to 6.00 pounds..
laptop-battery.com.sg strongly recommends you fully insure your return shipment in case it is lost or damaged and to use a carrier that can provide you with proof of delivery for your protection. DEFECTIVE returns can be returned directly to laptop-battery.com.sg within 30 days receipt, at laptop-battery.com.sg's discretion for: credit, replacement, exchange or repair. NON-DEFECTIVE returns can be accepted directly by laptop-battery.com.sg within 30 days from receipt, at laptop-battery.com.sg's discretion for credit or exchange. All NON-DEFECTIVE returns for refund are subject to a 15 percent restocking fee. DAMAGED ITEMS If merchandise arrives damaged: save the merchandise and the original box and packing it arrived in, notify laptop-battery.com.sg immediately to arrange for a carrier inspection and a pick up of damaged merchandise. Find discount Replacement Laptop Battery on laptop-battery.com.sg, high quality Notebook Batteries at laptop-battery.com.sg.